Here we are for episode FIFTY ONE - where we are pleased and privileged to welcome Brenda Boo back to the show for a proper chitter-chat. There are also some poems - some wintery walks and we also catchup with some of our regulars. Our next episode, number 52 - will be our special Valentine's Day show. Don't worry, we're taking the cynical approach - we won't be presenting anything too sickly! Anyway, it'll be out by the 14th, if not slightly before!! Please email me at shyyeti@yahoo.co.uk if you have any comments - you can even send me a sound-file and I'll include it on the show. Thank you to Brenda Boo for agreeing to be out guest this episode. *Additional thanks to Tim and James from Tastes Like Burning for allowing me to use clips from their show. This episode and all contents, except for *, are Copyright Paul Chandler, 2017. Episode 51 was recorded between 19th November 2016 and the 20th January 2017. Here we are for episode FIFTY TWO and Shy Yeti is sharing some thoughts for Valentine's Day - but they're not necessarily warm and fuzzy thoughts! 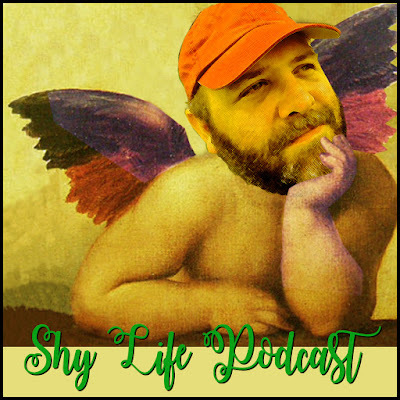 Oh no... You forget - this is THE SHY LIFE PODCAST and we're more about pulling fun at days like these... This episode Paul catches up with Wifey Jo to discuss some of their loves - there are lots of cheery poems for singletons and Nick G selects some of his favourite romantic records from The Vinyl Vault. All this and our regulars return to share some of their Valentine's musings! Our next episode, number 53, sees the return of a Young American - although she was born in Britain, so... anyway! Please email me at shyyeti@yahoo.co.uk if you have any comments - you can even send me a sound-file and I'll include it on the show. The music is by Shy Yeti and Luca. This episode and all contents are Copyright Paul Chandler, 2017. Episode 52 was recorded between 19th December 2016 and 14th January 2017. Additional thanks to Toppie Smellie for the show-art!! Our prose piece this time was written between the 7th and the 10th February 2017, although the idea first came to me on 27th January 2017. It wasn't an easy piece to complete and originally I was going to have written about more professions - but in the end condensed it into two jobs that do have associations with reading a (sacred) text - be it an A to Z for a taxi driver or a classification guide for a librarian. It was me joking about having to "consult the holy book" to catalogue some new stock that partly triggered me to consider writing the piece. Not only this, but further inspiration came to me after I heard people I know talking about their jobs - speaking like their work was up there in importance alongside hospital employees; when they are really no more than a middle manager with an inflated opinion of their own importance. This was also around the time that tube drivers and train companies seemed to be striking every other minute - causing most sane people to comment that in this day and age they were lucky to even have jobs and were well-paid by most people's standards; getting far more than nurses do, for instance. Anyway... Never mind that... It still works as a reality check to remind us not to take ourselves too seriously or to inflate our own importance when what we do might be valuable, but not up there as an emergency service. Our work may well be important - but is it THAT important? It's all relative. Next time we'll either be sharing with you another Shy Yeti sketch or possibly we'll be discussing the new BEAST OF FRIENDS special script-book... There's lots going on! That's all for now - but enjoy the prose piece at the end! Park Keepers - rise up and be heard! Should this book be filed under 355.01 or 355,48? Or you do so at your peril!